I recently got a Verizon XV-6700. This device answers most of my request for "convergence" from an earlier post. 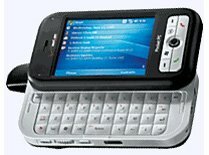 So far my feelings are that my Blackberry was a better email device, but the XV, with the new Direct Push technology is close. The Gee-Whiz factor though is amazing. Because it runs Windows Mobile 5, The collection of apps for this thing is endless, and most of them are free. I keep changing the assortment of programs on mine as I find which ones I ACTUALLY USE (A lot of the cool stuff is just cool, and not useful). I recently put SKYPE on it. Since it has both WiFi and EVDO, it makes SKYPE work almost anywhere. The other night I was trying it out, and sitting there thinking, who should I call? In the true essence of the "just because" rule of geekdom, I did it! Yes, I called myself. The SKYPE client was ringing out, and the phone started ringing in. I answered the phone call with speakerphone on, and got the modern equivelent of yelling into a cave or cliff. And, yes, I know you are wondering, I honered all of those kids playing with sound waves by saying the word E C H O !